Rolf Suey - Better Late Than Never: CapitaRetail China Trust to Continue Thriving in a Pessimistic China Economic Outlook? For my readers, I apologised for the quiet month of blogging. It is a busy month of flying across the continents! Finally, I am home today after more than ten days abroad in UK and Brazil. The traveling were not made any easier, with more than twenty-five hours of air travel single-way Brazil-Singapore not to mention additional hours spent on the roads and hang around at airport. Instead of snoozing during the travel and wait, I actually drafted few blog articles. Below is one. Earlier, I had blogged about China titanic advancement in the last decade and why I am bullish on its long term economic outlook. With this positive appraisal in mind, it is not surprising that I added a stock counter with China exposure lately. The company is CapitaRetail China Trust (SGX: AU8U) “CRCT” listed in SGX, owned 21.3% by CapitaMalls Asia as of end last year. CapitaMalls Asia was taken private few months ago by CapitaLand (SGX: C31), South East Asia largest listed Real Estate Company. CRCT is the first and only PRC shopping mall REIT in Singapore. It has a portfolio of 10 income-producing shopping malls in six of China’s cities including 5 malls in Beijing (78% of portfolio) and one each in Shanghai, Henan, Inner Mongolia, Anhui and Hubei province. Total GRA is approx. 605k sqm with over 70 million of shopper traffic. All the malls are located in populous areas that are accessible to major transportation routes or access points. 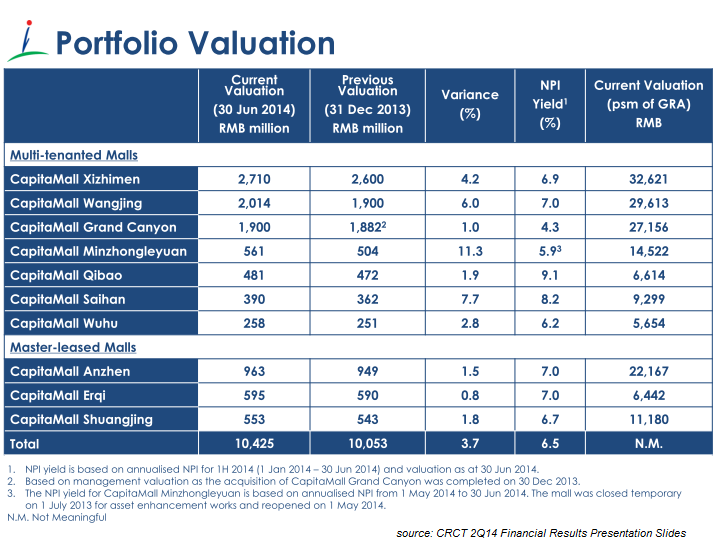 Below are more informations on the various malls within CRCT including their portfolio valuation. In the last 12 months, CRCT stock price range from a minimum of S$1.40 during end Jan 2014 to a maximum of S$1.70 during end Aug about two months ago. It settles at S$1.60 currently with a market cap of S$1.3b. CRCT has strong support from its Temasek backed CapitaLand with healthy fundamentals. Latest Price to Book ratio is 1.05 with dividend yield of 6.2% based on annualised 1H2014 DPU of 4.99Sc. Based on 1H14 results, gearing is 29.8% with an average debt of cost of 3.6% mostly fixed and well distributed for the next few years. Interest coverage is healthy at 5.5x and occupancy of its malls are strong at 98% capacity. 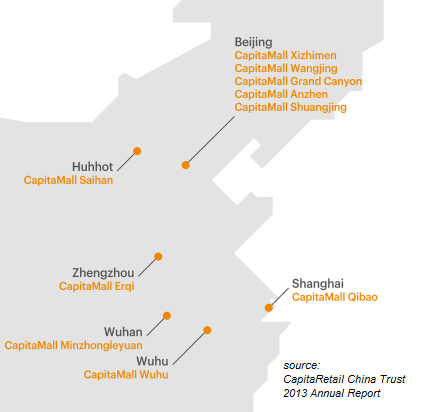 CRCT malls have a mix of Master and Multi-tenanted leases profile. Master lease is of typical 20 years to ensure stable cash flow. Multi-tenanted leases provide growth and include Anchor Tenant lease which is 15-20 years; Mini-anchor tenants 5-7 years and Specialty tenants up to 3 years. As of 1H14, there are 3 Master-Leased malls which contribute 22% of NPI and 7 Multi-tenanted malls accounting for 78% of NPI. CRCT tenants include big names like Wal-Mart, Carrefour and the Beijing Hualian Group (BHG) under master leases or long-term leases. The anchor tenants are UNIQLO, ZARA, Vero Moda, Sephora, Watsons, KFC, Pizza Hut and BreadTalk. The two Tenants in the month of Dec 2013 in terms of Total Rental income are 1) BHG occupies 41.3% of Total committed Gross Rentable Area (GRA) and contributes to 22.9% of Total Rental Income. 2) Carrefour Supermarket occupies 10.7% of committed GRA and contributes 4% of Total Rental Income. The rest of the tenants all contribute 4% or less of the Total Rental Income which gives CRCT a well diversify low risk spread of tenants. Near term growth stems from the recently revamped CapitaMall Minzhongleyuan mall opened 1 May 2014. Also CapitaMall Grand Canyon mall that was acquired in 1H13 is also expected to have its NPI raised by end-2014 due to new lease signed at higher rents. In the longer term, CRCT can tap on ROFR acquisition of CapitaMalls Asia assets granted by various CapitaMalls Asia funds. CapitaMall Anzhen, CapitaMall Erqi and most of CapitaMall Shuangjing’s GRA are contracted under master lease, which has provisions for increase of rental revenues through step-ups in the base rent. In addition, master leased malls also provide further potential upside through a percentage of tenants’ sales turnover if the turnover exceeds an agreed threshold. Similarly, most of the leases for the anchor, mini-anchors and specialty tenants have clauses with annual step-up in the base rent and include provisions for rent to be payable at the then applicable base rent or at a percentage of sales turnover, whichever is the higher. So far, CRCT had enjoyed healthy portfolio rental reversion of 24.9% as of 1H14. China rapid urbanization is definitely going to spur CRCT long term business prospects. Having seen myself and heard from my China friends, well-accessible malls in the cities are always busy and crowded. People in China love to shop! While the older Chinese generation are generally savers, the younger generations tend to spend more relative to their income. In view of the growing population and scarce land in bigger cities in China, property asset re-valuation upward potential is high. For the record, as of 1H14 compared to half year ago, CRCT’s portfolio valuation rose 3.7%. Of course not everything is smooth sailing. China is anticipated to experience decelerated economic growth than before, with loan default hard landing problems on the headlines speculated by many investors. The potential rising interest rate environment is not making it any easier too for CRCT future acquisition plans. Moreover, 87% of CRCT’s Total Rental Income is coming from committed leases with turnover rent provisions. There will be a danger of sales decline affecting the company rental income. There is actually another PRC shopping mall trust listed in Singapore - Perennial Retail China Trust (PRCT). If I am not wrong, PRCT is a Business Trust where I mentioned CRCT is the only China mall REIT listed in SGX. No problem, small hiccup. In fact I appreciate your pointer as it makes me look into PRCT. By the way, do you have a blog yourself for my reading? Thanks.